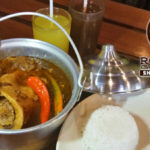 in a new Bacolod restaurant. The Spinner by SWIRLS ICE CREAM may be turned upside down and not fall off. Here in Bacolod City, the first and only ice cream house had long closed and there has not a place that has given emphases to serving only this cold delight. But not anymore. 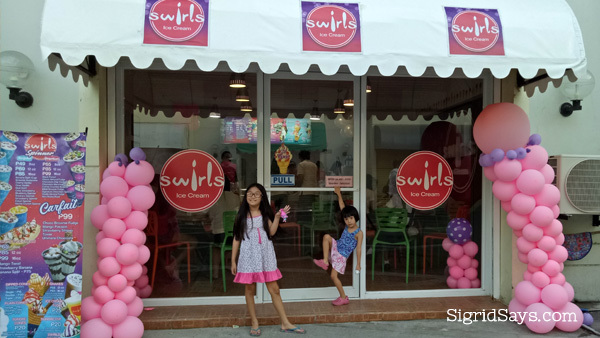 Now, we have SWIRLS ICE CREAM in Bacolod! They formally opened Monday, June20, 2017. 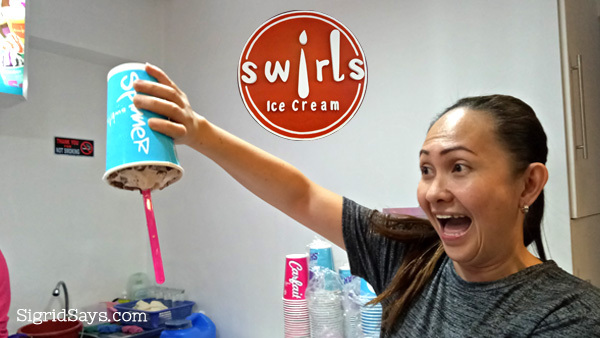 Swirls Ice Cream is a Bacolod ice cream house that features soft serve ice cream and the many different creations made from it. There are sundaes, parfaits (that they call Carfait), banana split, dipped cones, and even ice cream shakes. There are so many flavors, too! 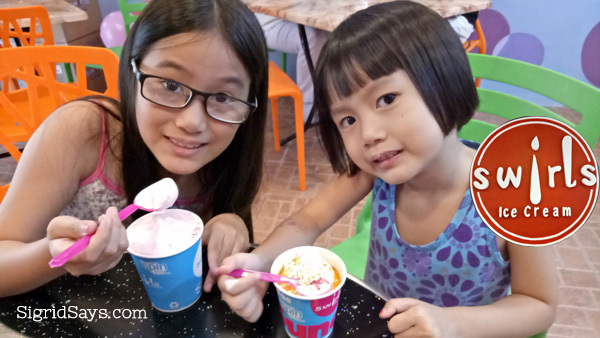 They are famous for the Spinner — ice cream that doesn’t even when you turn your cup upside down! But aside from their many selections, you would be happy to know about the price. 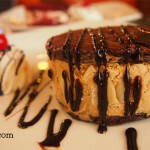 Their most expensive creation is only P99 and they come with high quality ingredients including nuts and whole cherries! And for those on a budget or those who just to keep their sugar level at a minimum, they have small sundae cones at only P10. Presyong estudyante! That is why it is a hit among students! 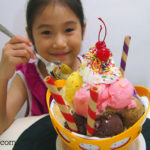 Kids enjoying their Swirls sundae. Dindin (left) has a 12oz Spinner while Siobe has an 8oz caramel sundae. 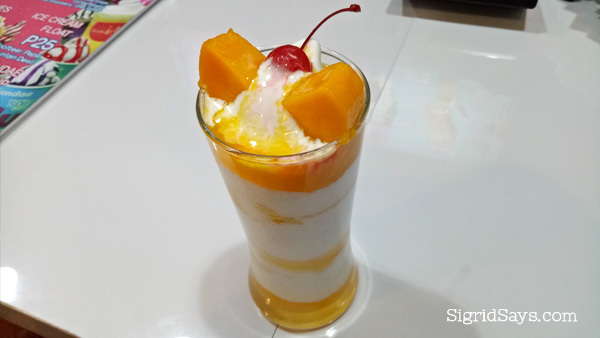 Mango Carfait — 16 oz of ice cream and fresh fruits for only P99. May be shared. 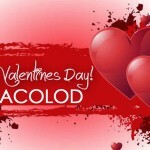 Swirls Ice Cream Bacolod at Main Strip Alley, La Salle Avenue, Bacolod City. 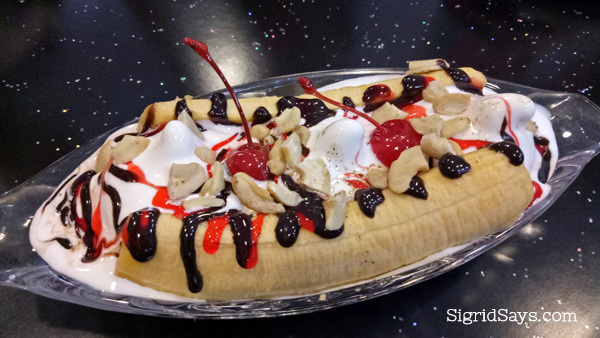 Banana Split is only P75. 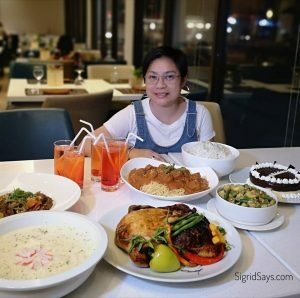 While La Salle Avenue may be a busy street during the day as this is a school zone, traffic dwindles before dinnertime and after dinner so if you want a quick dessert getaway in the early evening, this is a go-to place. 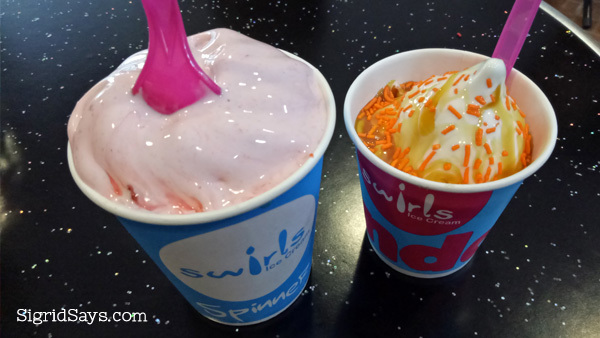 Left: 12 oz Strawberry Spinner (P69). Right: Caramel sundae cup (P20. ).